Samsung makes a variety of attractive ranges and stoves. If you're considering installing a new range in your kitchen, should choose a freestanding model or slide in model? Samsung makes both with identical features; however, in our opinion the Samsung model (#NX5889500WS) is more sleek and attractive. You might benefit from installing the slide-in model using the gap filling strips that are included in the package which creates a more uniform and custom appearance in the kitchen. 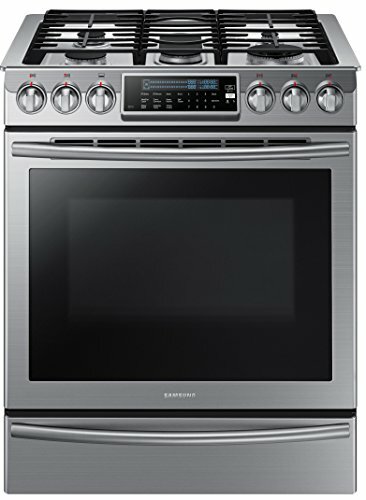 In this Samsung gas range review, we will discuss the pros and cons, features and bottom line of this slide-in range. The NX58H9500WS has flexible heating options with five burners that deliver various BTU levels. Two are 9500 BTU; one is 5000 BTU: one is 15,000 BTU, and one is 18,000 BTU. The center burner is equipped with a reversible cast-iron griddle. One side is ridged and the other side is flat to provide for quick cooking of dishes such as bacon, steaks and pancakes. The custom Samsung wok grate is equipped with a round bottomed wok to provide you with a variety of interesting cooking options. All of the burner grates are cast-iron, and the middle burner is oval for easy use with the griddle. The gas oven comes with a convection feature that provides air circulation throughout the oven for very quick and flavorful cooking results. The oven itself is spacious at 5.8 cubic feet. A generous three adjustable oven racks are included. One is a split rack that gives you a great deal of flexibility in positioning dishes within the oven. The delay-bake program allows you to schedule your cooking times so that you can begin cooking dinner even when you aren't at home! For safety’s sake, this range is equipped with an auto oven shut-off feature that turns the oven off if it is accidentally left on for an extended period of time. It's easy to see how your dishes are doing thanks to the effective and efficient interior oven light and the large oven window. These features allow you to keep an eye on your food without losing heat from the oven. The warming drawer is equipped with three temperature settings so that you can keep all of your dishes at proper serving temperature until it’s time to serve. A special and unique "Sabbath mode" allows you to maintain foods at safe temperature for long periods of time so that you can safely prepare and keep kosher dishes in advance of the Sabbath. There are knobs to control the burners like most ovens. However, setting the ovens temperature is easy and efficient thanks to the glass touch-screen. The range comes with an attractive stainless steel finish that is easy care. It’s best to use stainless steel wipes to clean with which will help avoid scratches and unwanted blemishes. This offering from Samsung is handsome in appearance, attractive and has many useful features and accessories and easy to control touch panel. One of the main drawing cards for this range is its appearance. It has the look of a far more expensive range, and it has lots of bells and whistles. If you like to bake, you will like the convection feature very much; however, the performance of the gas oven might not be quite what you expect if you’ve never used one before. Cooking with a gas often results in “hot spots” that doesn’t allow for uniform baking. For professional purposes, a simpler and less expensive freestanding range would be more useful. Additionally, we are a little disappointed in the low power of the 5000 BTU burner. Of course, there is always the option of using one of the other, more powerful burners! The lower burner is for sauces and items that require a lower temperature. We think it’s more of a gimmick, since all burners are independently controlled anyway. In the final analysis, it seems that the Samsung NX5889500WS is a good-looking gas range. While this gas range should be powerful enough for most home kitchens, it falls a bit short of perfect for professional settings. For these reasons, it would seem that this slide in range may be a good choice for the everyday home cook who wants a very attractive, all around appliance that offers a great deal of versatility. Did you enjoy this review? Let us know in the comments with your experiences with Samsung gas ranges.